I've had this idea for a long time, I just haven't done to much about it. Now when I have many other things (I should be doing) and multiple projects on the go....I start to fool around with it. I just grabbed a few scraps and started playing. I am liking the black thread...something I've not quilted very much with. I used raw edge applique for the circles....something I won't be doing for the actual project. I think I will use inset seams instead....just a little more finished looking. These test squares or almost mini quilts can be very valuable in making some of these decisions. I thought I better try joining a few of my blocks for Lily's Quilts QAL. I still have five blocks to quilt, but my curiosity always gets the best of me. Here is the back of the three joined squares. I watch in fascination, as all the Ticker Tape quilts emerge on Flickr.....beautiful as they are, gluing down and sewing around all those tiny pieces.....it's just not going to happen, I'm way to lazy. The what if factor has a way of kicking in at this point. First of all forget the glue thing and use bigger pieces. Then the biggest time saver of all, stitch the majority of the pieces, in straight lines...continue stitching on the back ground fabric between the pieces, rather than stitching around each piece. I found some larger squares left over from another project and decided to play around a little. I laid them on the yellow background fabric, which I spray basted to the batting first. I also spray basted the backing to the batting as well. I am stitching through all the layers at same time. As you can see, I am stitching all the raw edges down with a zig zag stitch, but I am just crossing right over, to each piece, instead of going around each piece. I then added some straight quilting lines. Here is the back of the block...all quilted. This is just a very simple example of what can be done. I'll join the blocks with strips, after all the blocks are finished. So if you have been intimidated by sewing down all those little pieces, be like me and take the lazy way out. This is a great way to use up some scraps. 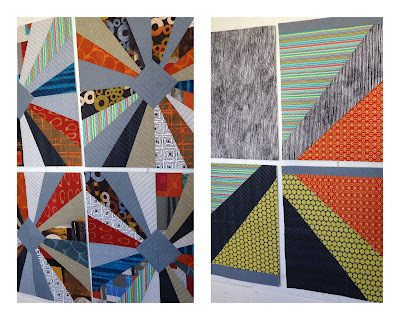 I am enjoying all the beautiful quilts entered in this year's Bloggers' Quilt Festival. If you have a minute, take a browse at Amy's Creative Side and you won't be disappointed. I have chosen to enter a sampler quilt I made in 2008. This quilt is an example of what I love to do best.....play around with fabric. I often have "experiments" laying around and decided to join a few of them into a sampler type quilt. 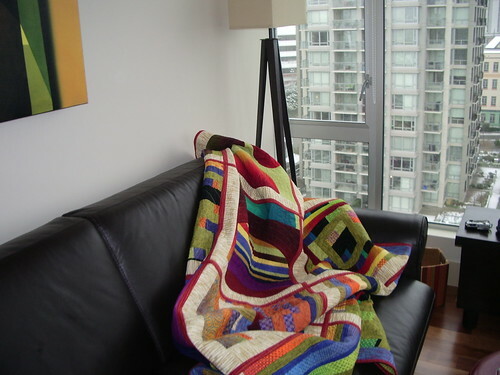 The colours in the quilt are influenced by a walk I took one fall day, in the beautiful river valley, in our area. Because of all the different blocks it looks different every time I fold it. I probably learned something different from each different block. Just playing with each technique gave me more experience. I was to challenged to throw caution to the wind and trust my own instincts. This quilt ended up being a bit of a hodge podge but, it's one of the few quilts that I haven't given away....I use it almost every evening, when I'm in Victoria. I just couldn't resist squaring up and joining four of the blocks. Since I have no patience I just had to quilt this block before I do anything else! I haven't made anymore decisions on this......so,your guess is as good as mine. After a week of fighting a cold and a wonky back.....I did it again....started something new. I've been resisting this bucket of shot cottons for quite a while now. What can I say, my reserve was down. A wonky back calls for some wonky piecing. How about some improvised, wonky, curved piecing. Nothing to hard about that. Stack a few fabrics...I used eight. I use only one pin....if that. Four blocks quilted and five to go. I'm making progress but could be distracted quite easily. What could possibly distract me?? This little goodie, that arrived this week...my new ipad. After literally hijacking my husband's ipad, during our sailing trip.....yes there were some raised eyebrows when I asked him if he had seen MY ipad....I talked him into buying me one, of my very own, for my birthday. It arrived this week, the newest version I might add. A better woman would have let him have newer model but, but I'm not that better woman. Now let's see what this little wonder is capable of......Wow, I can blog from anywhere now. When we put our work out there, for the world to see, it might will be evaluated or judged. I believe it comes with the territory. 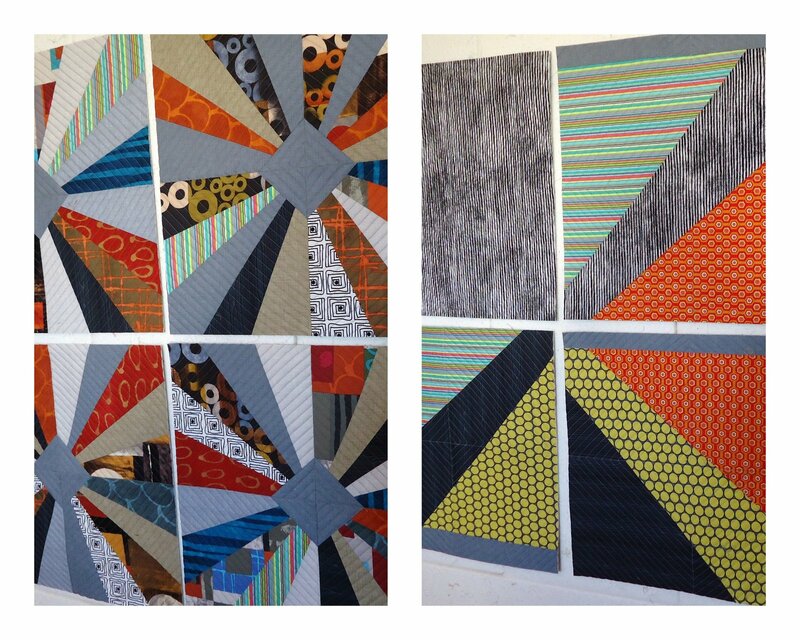 When I actually put my first quilt on Flickr, I found it uncomfortable frightening, to say the least. Before I did that, family and friends were the only ones to see my work. This online, photo sharing community is fairly new. It's like putting your work in a gallery where people are free to leave comments...some maybe not so nice critical comments. THE UPSIDE .....people are seeing your work and you are seeing theirs. You are getting affirmations and engaging in interesting discussions, plus making friends, with people of similar passions to yours. You are getting all this,with fairly little cost involved. 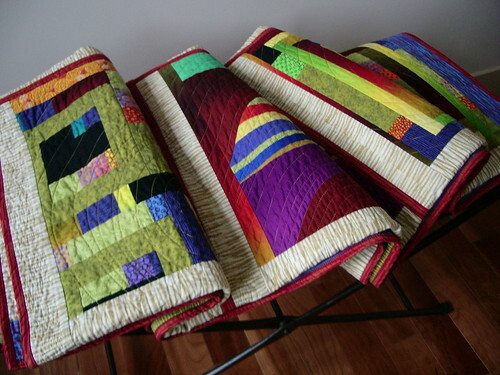 You are gaining knowledge and inspiration from fellow quilters/artists. THE DOWNSIDE ....you might be compared or criticized. I believe it's part of putting your work out there. All the criticism won't be fair or kind....but much of it will be. As a result of so many people seeing our work, isn't some competitiveness inevitable? After all many quilters put their work in competitions. 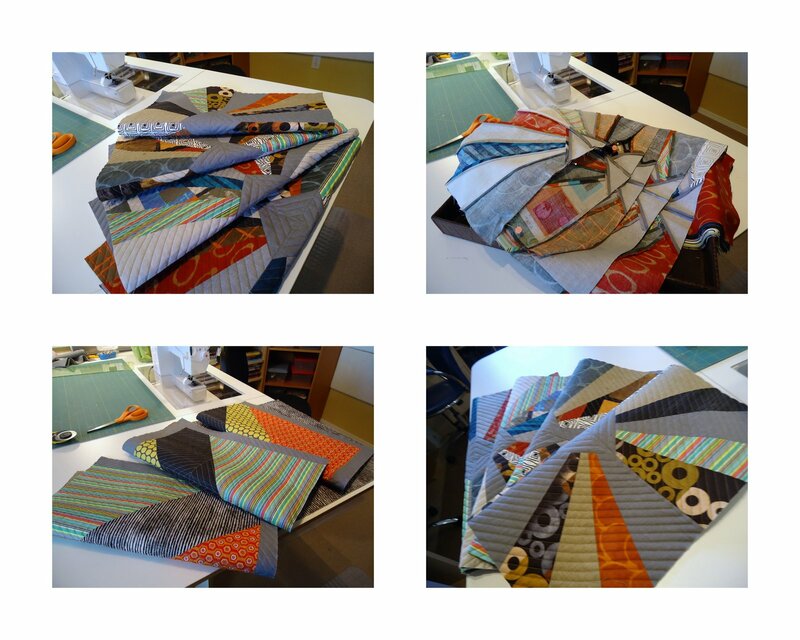 Rachel asks the question...How do we describe our quilting or sewing style in an interesting post here. When does the fear set in? Fear of not being perfect or good enough. Throw your caution to the wind. It is only the blank page in the sketch book or blank canvas on an easel. It is my sketch book and my canvas. Think not....but where will this art hang or who will it go to? Just let it emerge and let it be. You are free to do that. There is no harm to be found in your choice of line or colour, as there is in your actions or choice of words. There is freedom...if you cast off doubt, fear and expectations (yours and those of others). This applies to my quilting as well. I want to be fearless and free in my quilting. I've overcome most of my fears about putting my work out there....some criticism is inevitable and I'm okay with that. "Who has thrown him (Piet Mondrian) into this mad confusion? That isn't easy to say. But it was probably Van Gogh. What is certain that once he threw off all academic constraint, he has lost his balance and has taken to daubing in the most abdominal style. The work of a sick abnormal man. Not even art." So, here we have Piet Mondrian's art, heavily criticized and the blame put on, Van Gogh, for Mondrian's fall into "mad confusion"
These are two of my favourite artists and their work is as different as night and day. If these artists had to deal with this type of criticism, I imagine some of it might, be directed at us now again too. I believe it comes with putting ourselves out there....I think it's worth it, what do you think?